The performance of Joseph Mbong (centre) was praised by national coach Ray Farrugia. Malta coach Ray Farrugia hailed the tenacity and character of his players as the national team provided an encouraging response to last week’s debacle in the Faroe Islands when they battled to a 1-1 draw against Azerbaijan in the UEFA Nations League Group D3 match at the National Stadium. It has been a few difficult days for the national team in the run-up to the match against the Azeris as the players were subject to a barrage of criticism after the disappointing defeat in Torshavn. But on Monday night, the national team answered their critics in the right way with a gutsy display against the more-quoted Azerbaijan to pick up their first point in the newly launched UEFA competition. “I’m really happy with the result,” Farrugia told reporters at the end of the match. “Obviously I would have been happier had we won the match but to be sincere I think a draw was a fair result as both teams deserved something for their efforts. “I only have words of praise for my players who played a great match today. For us it’s not easy to play two matches in the space of three days but they rose to the occasion and provided the right answer to all the criticism they faced in the past few days. 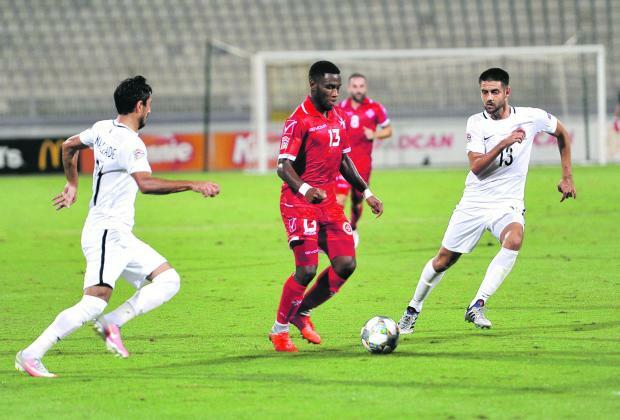 The Malta coach heaped praise on young wing back Joseph Mbong who enjoyed another impressive performance and highlighted the contribution of several veteran members of the team. “Joseph Mbong had another fantastic performance for us today. He showed great personality against very difficult opponents,” the Malta coach said. “Ferdinando Apap was another player who stood out when he came on in the second half. I knew that he can be a valuable member for our national team and today he proved that. “But one cannot not mention the contribution of our veteran players. Michael Mifsud, Andre Schembri, Paul Fenech, Andrei Agius and Roderick Briffa were fundamental for us as their experience helped the team in difficult moments during the match. The national team’s commitments in the Nations League resume next month when with an away double header against group leaders Kosovo and a trip to Baku to face Azerbaijan. The Malta coach said that he is aware that the national team is far from a finished article but reiterated his stance that the only way for the players to improve is that all stakeholders stick together and give their contribution towards the common goal – to help the national team reach higher levels of performance in international competition. “The only way forward for us now is to continue to stick together and look forward with optimism,” Farrugia said. “I have only been in charge of the national team for five months and I can already see the players approaching national team duty with a more positive frame of mind and are ready to make a lot of sacrifices. There is no doubt that the result against Azerbaijan has infused more enthusiasm among Maltese football fans on Monday night but that doesn’t wipe away the problems afflicting the development of our ‘Beautiful Game’. These two Nations League matches have again highlighted the fact that our national team still lags behind fellow European minnows such as the Faroe Islands. There are various reasons behind this sad reality and when one puts them all together one concludes that the set-up of our ‘Beautiful Game’ is not good enough. The majority of our national team members ply their trade in the Maltese Premier League which produces far from high-quality football week in week out and it’s no surprise that our players end up struggle to match the higher intensity and physical fitness of their foreign counter parts on the international scene. made by clubs and the Malta Football Association (MFA) to ensure that our most promising players are quickly shipped to a foreign club to help them develop into better players. A lot of criticism that the Maltese national team has to encounter is the fact that they do not manage to achieve positive results against fellow minnow opponents, such as the Faroes. this debate, can see that Malta’s first two opponents in this competition boast players with a certain pedigree on the European stage. The Faroes can bank on various players who feature regularly in the Norwegian or Danish top tier leagues, which are highly competitive especially when compared to the Maltese one. Moreover, their main forward, Joan Simun Edmundsson, plies his trade in Germany’s second tier of football, at Arminia Bielefeld, who in relation with Maltese football, it is still a very tough and challenging movement. Meanwhile, Azerbaijan have majority of their players who play in the domestic league, mostly with Qarabag, Gabala and Neftci Baku. Buoyed by some important investment, mostly at Qarabag, such clubs are able to advance in European competitions, with Qarabag also becoming the first Azeri side to reach the UEFA Champions League group stages, last season. Nurturing new talent will take time but in the meantime it’s vital for the future of our game that we start taking the right decisions to ensure that our national leagues are more competitive. The level of football displayed on a weekly basis in the Premier League is waning with every season that passes and surely the decision to increase the number of teams in the top flight to 14 teams and the rise of overseas players to seven has further hurt the chances of Maltese players to improve their game, or at least gain enough top-tier football in their legs. If we really want that our national team start to be more competitive on the international scene we need to start address the shortcomings, which have stemmed from wrong decisions taken by the clubs and the local governing body. Farrugia is currently finding himself forced to work with a close group of players that have the ability of donning the Malta shirt as young players are struggling to make the grade at the highest level. It’s high time that we start taking decisions that will help our young players to maximise their potential by playing more regular football and in the process attract foreign interest in their services. The national team is not only the responsibility of Farrugia and his technical staff but of all member clubs and officials that form part of the Malta Football Association (MFA). The national team is clearly at crossroads and it’s imperative that all stakeholders in the game ensure that it takes the right path to finally restore the team to acceptable level of performances on the international scene.